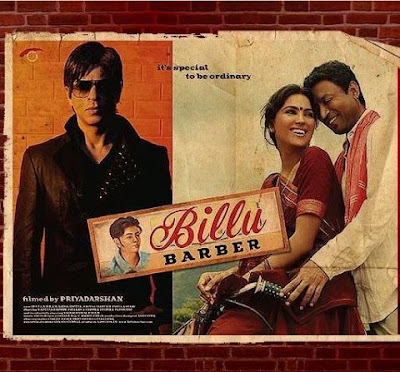 Billu (Irrfan Khan) is a poor village barber, with a wife (Lara Dutta) and two kids. He struggles to make ends meet, but has courage and dry humour to withstand it all. Somewhere else, popular film star Sahir Khan (Shah Rukh Khan) select's Billu's village as a location for his latest film. How the destinies of these two men unfold makes up the story. Priyadarshan can't get out of his 'making every scene comic' mode and his dialogue writers make sure we don't laugh at most of the supposed jokes. The climax of the movie is convincing, but by then, it is only a gleam in the otherwise forced-comic-drama-melodrama proceedings. Watch the original Malayalam film that is more deftly, simply made - Katha Parayumpol (2007).